2018-04-17 - Shakespeare in the Barn at Homeplace on Green River, 5807 New Columbia Road, Campbellsville, KY - Photo by Ed Waggener, ColumbiaMagazine.com. Best Seats in the House. - They didn't have the only straw bale seats in the house, but these three had the only ones with a back rest. 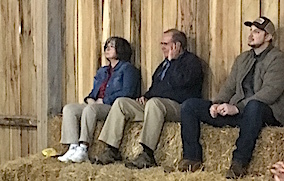 From left, above, are Becky Burris Rowe and husband Richard Rowe, of Owensboro, KY, and North Century Pharmacist Easton Bryant, Columbia more often seen as a participant than a spectator at local performing arts events. These straw bale seats command a great view, and, because of the accoustics the wooden shell provides without amplification, audio is natural, and great, too. George Kolbenschlag said that the director of Shakespeare in the Barn, Robert Brock, remarked that the wooden walls were like a fine accoustic guitar or fiddle - perfect, even without a sound system. - EW.